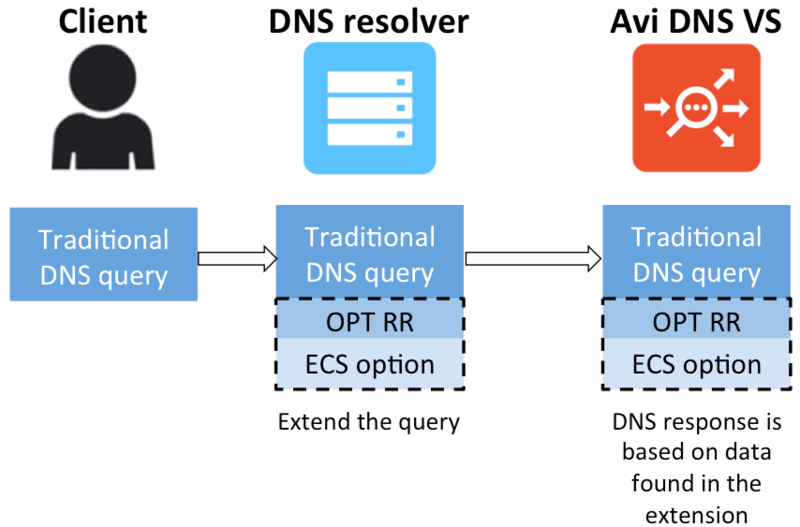 Avi Vantage supports insertion of the ECS option in a DNS query if the query has no ECS option. It supports updating of the ECS option if the DNS query already has an ECS option. Since it was first developed, the Domain Name System has required enhancements. Restrictions in the size of several flags fields, return codes and label types available in the basic DNS protocol has motivated extending DNS in a backward-compatible fashion to allow for new flags and response codes, and to provide support for longer responses. Since 1999, extension mechanisms for DNS (EDNS) has been the approach taken to address this challenge. 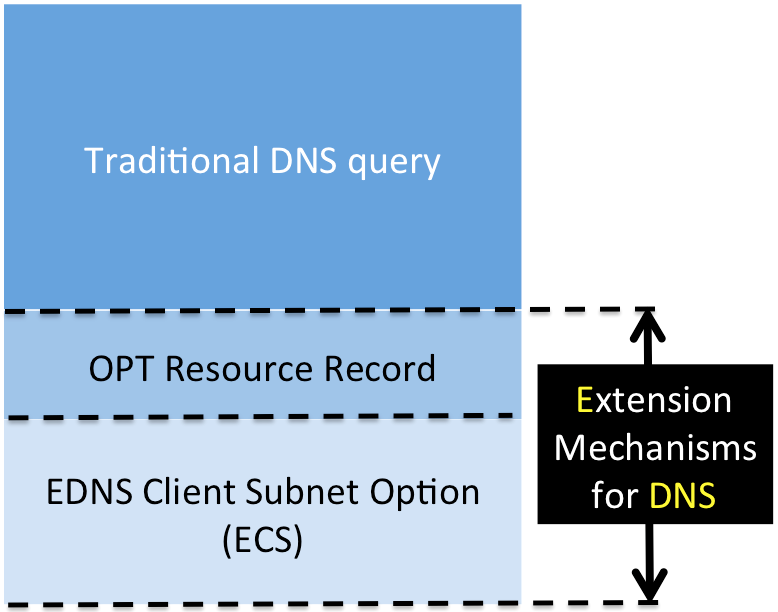 As mentioned, the Avi DNS virtual service can directly profit from the information in OPT RR and the ECS option while acting as an authoritative DNS. To have it parse that information and append EDNS extension information into the client logs, check the Process EDNS Extensions box in the Avi UI as shown in Figure 2, or set the corresponding edns parameter to True in the Avi CLI. In addition to checking the Process EDNS Extensions box having been checked, ensure that a list of authoritative domain names has been provided, as for example in the below Avi CLI sequence. Now suppose that the in-bound DNS request shown in Figure 3 is for one of these domains. The client system sends a traditional DNS query to its DNS resolver. Note that the request it sends contains neither an OPT RR nor an ECS option. Based on the source address of the client, the DNS resolver may amend the DNS query it receives. It does this to enable the authoritative DNS to respond in a more informed way, i.e., based on the address of the client, as opposed to the source IP of the DNS resolver itself. The Avi DNS forms the response based on address information it finds within the ECS option. edns_client_subnet_prefix_len, an Avi DNS VS application profile parameter set by the administrator via the CLI. Its value ranges between 1 and 32. When rounded up to an integer multiple of eight bits, it specifies the number of octets needing to be passed. 24 bits, i.e., three octets need only be passed to identify the subnet. A fourth octet would be superfluous. If the incoming subnet prefix length is less than the value of the Avi DNS’s edns_client_subnet_prefix_len parameter (refer to Figure 2 for the Avi UI interface to it), the ECS option will be untouched as it passes through. If the incoming subnet prefix length (e.g., 26) is greater than the value of the Avi DNS’s edns_client_subnet_prefix_len parameter (e.g., 16), Avi will zero out some incoming bits (e.g., 10 in this case), and, if the lengths are sufficiently far apart, forward fewer octets (e.g., 2 not 4) to the DNS server shown on the right of Figure 3. In Figure 5, we see the DNS request arriving from the DNS resolver with no EDNS information whatsover. In addition, the DNS request is for a domain for which the Avi DNS is not authoritative. Thus, a pass-through is required. In this case, the Avi DNS VS will create an OPT RR, and, for the ECS option, insert a client subnet address with 1 to 4 octets and an appropriate number of trailing zeroes, in a fashion as described above.